As the 2017 Formula 1 season draws near, many fans flock to Formula 1 related pages in order to keep up with the latest developments as teams test their new cars before the season starts officially on March 24th, 12:ooh local time in Melbourne, Australia – when the lights for the first free practice session of the Australian Grand Prix turn green. In these series of posts, I will transcribe the most important stuff happening on track on an hourly basis, and follow it up with an analysis based on 2016 testing results. This post will detail the goings-on at the Circuit de Catalunya for the first day of testing, on February 27th. If you want to know more detail about these pre-season tests, or want to know the importance of it, feel free to read this post first. 9:00: The lights are green for the first official running in the 2017 season. Within the first twenty minutes, all ten cars have made their maiden entry on the track. The first to post a lap time is Valtteri Bottas, posting a 1:33:445 in his Mercedes W08. After the first run set by Alonso, however, the McLaren Honda is forced back into the pits with an oil distribution problem. A few minutes later, Vettel posts a 1:23.560, which is already faster than the fastest time on the first day of testing of 2016 (which was a 1:24.939). The first hour of testing is cut short by a red flag, caused by Daniel Ricciardo parking his car on track with a defective sensor. 10:00: at 10:06, the lights turn to green once again after Ricciardo’s car has been cleared from the track. McLaren confirms the problem they experienced with the oil system will take them a couple of hours to fix. Meanwhile, most of the other cars are setting loads of laps, testing the aero on the car using racks filled to the brim with sensors like the one pictured below – it kinda looks like scaffolding. 11:00: Bottas does a stint on the soft compound, setting fast times (1:24’s) in the process. He does a long stint, goes in for fresh tires, and sets a new fastest lap at 1:23.169, just .4 of a second slower than the fastest time in all of last year’s testing (1:22.765) which was posted on the third day of the second week of testing by Kimi Raikkonen. 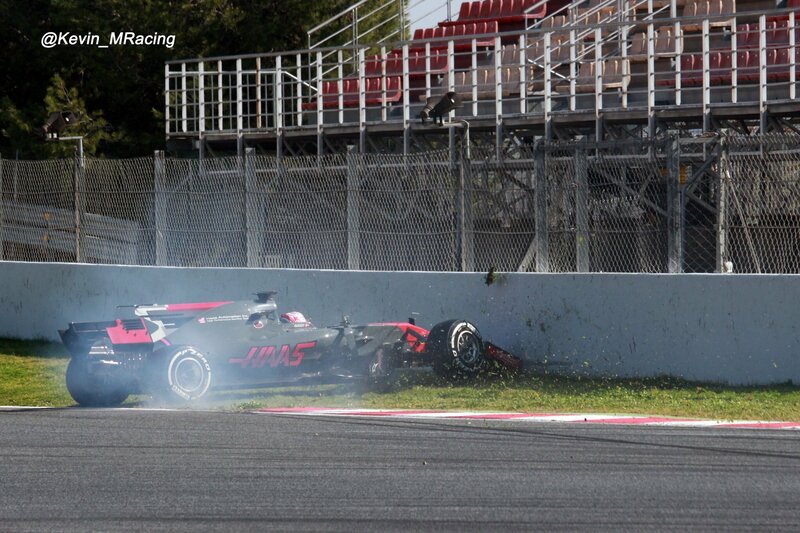 Before noon, Bottas has already driven 50 laps, unhampered by the stoppage of Magnussen’s Haas exiting the pitlane. Bottas, though, will have to hand over the keys to his car to Hamilton for the second part of today’s session. 14:00: The afternoon session started with Ricciardo returning his car on the track, after having been sidelined since the defective sensor, while Hamilton took over control from Bottas. Others, including the Haas fitted with a new front wing, returned to the track as well, steadily setting faster and faster lap times as time went on. 15:00: Not a lot happening, except for Massa nabbing the top spot with a 1:22.727, meaning that the fastest time today is now officially faster than the fastest time driven during testing last year. He went in for a new set of soft compound tires, and improved his time even further, to a 1:22.536. Right before the clock turned round again, however, Vettel retook the top of the chart by setting a 1:22.475 on the boards. 16:00: Not long after, on the same set of tires, Vettel further improves his time to a 1:22.370. Ricciardo meanwhile comes back into the pits with a defective battery, adding to his Red Bull’s list of issues. Hamilton, on the other hand, absolutely nailed a lap down by driving a 1:21.765 on the soft compound, showing the competition what’s what. Fifteen minutes later, and Ricciardo’s battery seems to have been replaced as he headed back out of the garage. Also leaving the garage is Alonso in his McLaren, who finally seem to have fixed the issue that prevented them from completing any lap, but heads back in after his outlap. Third time’s a charm though, as he soon after posts a 1:26.110 and brings it down to a 1:25:586 not long after. 17:00: As the final hour of testing today started, Alonso finally hits double digits of driven laps. As the sun sets, the track gets cooler meaning that improvements to lap times will become sparse. Hamilton, Alonso and Vettel are within a few hundred meters of each other on track, creating at least some excitement in this final hour. The first one to officially hit the showers today is Sergio Perez, who had some issues with his Force India’s exhaust. Fifteen minutes before the checkered flag drops for a final time today, Hamilton, Vettel, Massa and Hülkenberg are still driving on track. The last to improve on his lap time is Ricciardo, setting a 1:22.926 right before the checkered flag drops. Now for the fun part. To compare these results, we need also to factor in the weather. In 2016, the first day of testing was held on February 22nd. At that time, it was a sunny 16-17 degrees Celsius in Barcelona, with mild winds reaching 15km/h. During the morning session, it was a sunny 17 degrees Celsius as well, with winds up to 25km/h, meaning that weather will not play a deciding factor in any large differences in times. During the afternoon session, the temperature peaked at 19.7 degrees C, meaning that it is possible that there is a possibility these higher temperatures caused an estimated .1-.2s decrease in lap times. With that out-of-the-way, lets look at the differences in lap times between this test, and last year’s. The average time last year on the first day of testing was a 1:26.801, while this year the average lap time is 1:23.622, which is a decrease in lap time of 3.66%, or 3.179 seconds. This also means that the average lap time in km/h for the 4.655m long track went from 193.0 km/h to 200.4 km/h, which is quite a big improvement. Last year, it was expected the new regulations would give teams about four seconds off a five kilometer lap, and this just about confirms it. As far as individual results go, I’m surprised by Mercedes immediate pace, as they often tend to mask their true performance as seen in my previous analysis. Ferrari is hot on their heals, but they like to flaunt their speed early on – but they still haven’t posted a hot lap on soft compound tires. Red Bull was plagued with technical problems, as was McLaren, so I think they will perform a lot better tomorrow if their cars can take it. Williams was a positive result, but I was disappointed by Force India. The team most in trouble though, seems to be Sauber. 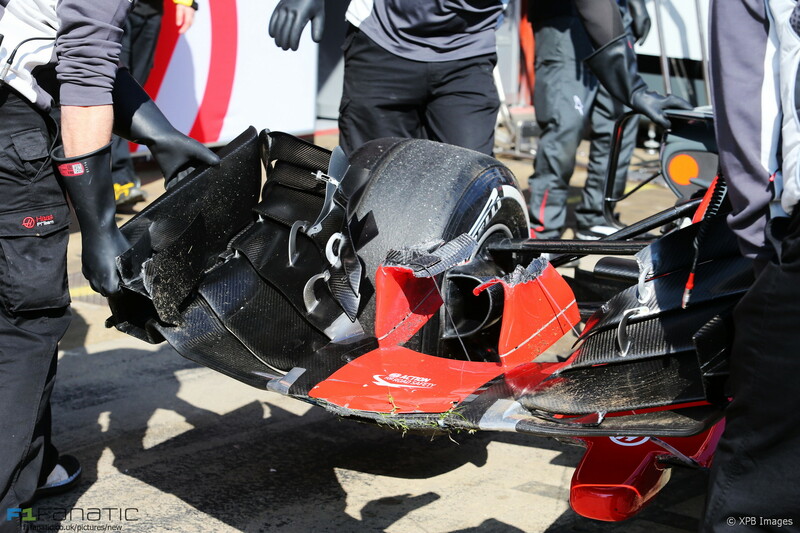 They had no apparent technical problems, and only posted minor gains as compared to last year’s car. Hopefully they will improve a lot in the coming days as well. Haas’ big difference with last year is easily explained through the fact that last year they made their debut as a team on that very day. A shout out to Mercedes’ reliability though, their car ran 152 laps without any trouble. Also a shout out to Vettel showing his work-horse mentality, he will probably have a sore neck after completing 126 laps today, which is almost two full race distances (one race distance is 66 laps in Barcelona). As things look like they do based on this result, it will be another year dominated by Mercedes. Hopefully Red Bull can recover tomorrow, though I doubt they will show the full potential of their car this week, or even next week, as Renault’s engine is entirely new and is supposed to get an upgrade once the teams reach Barcelona for the Grand Prix of Spain. Tomorrow we will see another full day of testing. Hopefully, neither team has any real mechanical trouble, so we will get some more data on their relative speeds. We will also see most other drivers make their debut in the 2017 spec car, including Max Verstappen (Dutch pride, sorry!) and Canadian rookie Lance Stroll. Tomorrow will also see me return in posting the second round of analysis, so stay tuned!